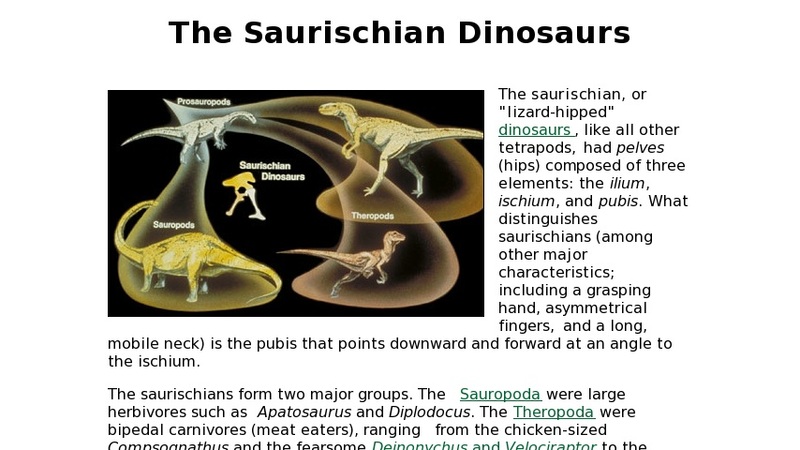 This description of the saurischian or "lizard-hipped" dinosaurs discusses the major characteristics that distinguish saurischians from other tetrapods that also have pelves (hips) composed of three elements: the ilium, ischium, and pubis. These are a grasping hand, asymmetrical fingers, a long, mobile neck, and a pubis that points downward and forward at an angle to the ischium. There is also a clarification of the "bird-hipped" designation.